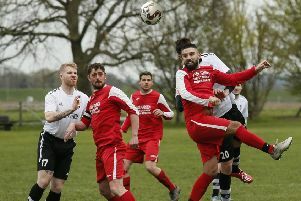 Shefford Town & Campton are the new Bedfordshire League leaders after their unbeaten run continued with an 8-0 home win over second from bottom side Lidlington United Sports. Andrew Hayday, Adam Larsen, Michael Jones and Chris Slough all netting braces to do the damage to see them top the Premier Division supported by Sportsform table on goal difference over Renhold United. Losing out on the top spot on goal difference are Renhold United who were required to come from 2-0 down at half-time to maintain their seasons 100% away record with a 3-2 win at Sharnbook. Leon Taylor and Richard Ball shooting the home side ahead but two strikes from Jonny Richens and a goal from Aran Hazelwood won the day for United in the second period. Now up into third spot are AFC Oakley M&DH who are now unbeaten in their last five starts after winning 5-3 at Caldecote. Trailing to a sixth minute goal from Mark Franklin they were to draw level when Oli Plested converted from the penalty spot four minutes later only to then fall behind again when Jordan Goodman netted a free kick from all of 30 yards out with the watch showing just 14 minutes played. Back level in the 18th minute via a Matt Barnes header the visitors took the lead for the first time when Plested netted his second goal of the game five minutes from the break. This lead was to last just five minutes into the second period before Chris Sams made it 3-3 and game back on. This was to last until Robert Heaney struck in the 66th minute to regain the lead for the visitors before Plested completed his hat-trick and brought up the nap hand five minutes from time. Dropping down from third to fourth in the table are Marston Shelton Rovers who were beaten 1-3 at home by Wootton Blue Cross. Ryan Mellor, Nathan Mallett and Callum McAdam on the winners scoresheet against a lone Rovers reply via Harry Murray. For fifth place Flitwick Town its now five games unbeaten after winning 6-0 at bottom of the table Ickwell & Old Warden. Daniel Stafford leading the way with a hat-trick and supported by goals from Jim Lewis, Ritchie Bevan and Ryan Hill. Still on the outlook for their first home wins of the season are both AFC Kempston Town & Bedford College plus AFC Turvey. Town went down 3-1 to Sandy in a game where all the goals came in the last 10 minutes. Tom McGhee, Tom Burton and Jerome Mullings netting for Sandy against a lone home reply via Josh Sturniolo. Whilst AFC Turvey were beaten 6-4 by Wilstead who thus ended a five game losing run. Paul Jones the lone hero with all six goals against home replies via Gamba Kannan, Harry Ellis, Mark Allen and an own goal. The final top flight game saw Pavenham claim a 3-0 home win over Eastcotts AFC. James Owen netting twice and Jack Harding once. Third place Cranfield United retained their 100% home record and moved to within two points of second place Elstow Abbey with a 3-0 win over Shefford Town & Campton Reserves, James Armstrong netting twice and Jordan Appleton once. Also winning on home soil were both Potton Town & Riseley Sports. Town, with goals from Chris Cooper and Paul Mijalski, beat Bedford SA 2-1 and for the Sports it was a 2-0 victory over AFC Kempston Town & Bedford College Reserves who have now lost their last six games to drop to 11th place in the league table. Mark Darlow and Josh Poole netting the goals to do the damage. The AFC Harlington v Sundon Park Rangers game was postponed due to the state of the New Grounds pitch. Safely into the hat for the quarter-final draw are Queens Park Crescents who with two goals from Shazed Sattar were 2-0 home winners over Luton District & South Beds League side Crawley Green A and joining them in the hat will be Great Barford who were 6-5 penalty shoot-out winners over Meltis Albion after 90 minutes play had seen the clubs deadlocked at 1-1. Elijah Hukin netting for the home side and Padraic Walsh for the Albion. However it was the end of the road for AFC Oakley M&DH Reserves who were beaten 13-0 at Luton District & South Beds League Caddington Rangers. There is no change at the head of the division two league table following wins for the top four clubs. The biggest win belonged to league leaders Westoning who ran out 17-3 home winners over Caldecote Reserves to notch up their sixth consecutive win. Thomas Cooksley netted six times, Sean Cooksley four times alongside a hat-trick for Michael Armitt and a brace from Glen Cooksley to go with single goals from Bryn Reynolds and James Lovett.The visitors replies coming via Nicky Albone, Rhys Parker and Jake Bruce. For second place Clapham Sports it was win number five on the bounce with a 4-2 victory at Renhold United Reserves. Sam Maddix grabbed a brace along with strikes from Grant Williams and Michael Woodward only being replied to by Michael France and Delroy Philips for the home side. Whilst third place FC Houghton notched up their ninth win on the bounce when winning 4-1 at Kempston Athletic. Lawrence Taylor with a brace plus single strikes from Haydon Fletcher and Charlie Nicholson only being replied to by Gavin Matthews for the Athletic. Keeping up the pressure on the top three are fourth place Stevington who claimed their seventh consecutive win with an 8-2 victory at Elstow Abbey Reserves. Kieran Souter netting four times alongside single strikes from Ben Souter, Jordan Wright, Sam Nightingale and Gavin White.The Abbey replies from Shaun Cafferty and Andy Klein saw them recover from 4-0 down to end the opening half just two goals behind before they fell apart in the second period. There was also a big away win for Bedford United who returned to winning ways with a 7-3 victory at bottom of the table Wilstead Reserves.Aaron Perrett with four goals being supported by a brace from Guiseppe Lamberti and a single strike from Owen Ward against home replies via Luke Pursey, Ryan Davenport and Cain Hamilton-Boyle. Also winning on the road were Moggerhanger United 3-1 at Meltis Albion Reserves. Lee Adams, Brandon Bates and Tom Gibson seeing their goals only replied to once by Antony Ursell. Whilst for Wootton Village and Kempston Hammers Sports it was the sharing of the points in a 1-1 draw. The Village going ahead in the first half via an own goal and the Hammers drawing level in the 90th minute via Jim Grandidge according to the Hammers but via an own goal according to the Village. With Mid Beds Tigers failing to raise a side to travel to face Lea Sports PSG, the three gifted points keeps the boys from Pirton on top of the division three league table just a point clear of Atletico Europa who took their unbeaten ways up to five games by winning 7-0 at Shefford Town & Campton A. Kane Alexander netting five times alongside single strikes from Aaron Hill and Joel Tatham. Dinamo Flitwick started the day in third spot but now find themselves down in fifth place after losing 5-3 at Clifton who now take over that said third spot. Jack Brown with a brace plus strikes from Kieron Carrington, Andy Harvey and Tony Norman bringing up the home nap hand against replies via James Burton twice and Tom Sargent once. Also jumping above Dinamo into fourth place are Cranfield United Reserves who won 4-0 at Caldecote U20. Daniel Mclaren with a hat-trick plus a Phil Distin penalty doing the damage. Elsewhere it was an end to Westoning U20’s eight game losing run with a 2-1 win at White Eagles. James Clegg and Rex Ludlow netting the vital goals against a lone Eagles reply via Marcin Ptak. Whilst Flitwick Reserves retained their seasons unbeaten home ways when sharing the spoils in a 0-0 draw with Ickwell & Old Warden Reserves. Meantime, FC Serbia were 3-0 home winners over Sandy Reserves thanks to a brace from Marko Djordjic and a single goal from Zoenko Kuhar.